SELYSOS - Development of new electrode materials & understanding of degradation mechanisms on Solid Oxide Electrolysis Cells - Pyrogenesis S.A. This project has received funding from the Fuel Cells and Hydrogen 2 Joint Undertaking under grant agreement No 671481. This Joint Undertaking receives support from the European Union’s Horizon 2020 research and innovation programme. 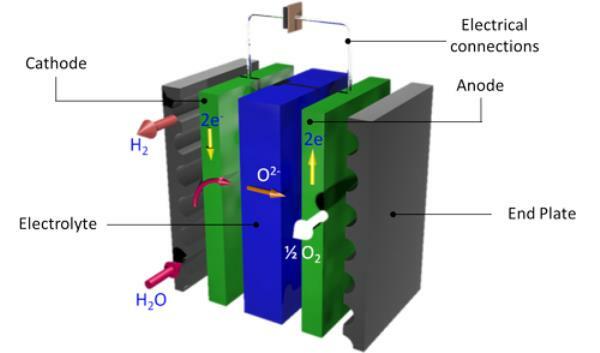 Solid Oxide Electrolysis Cell (SOEC) for hydrogen (H2) production. The project is focusing on both of the Solid Oxide Electrolysis Cell (SOEC) electrodes, for minimization of their degradation and improvement of their performance and stability mainly under high temperature H2O electrolysis for the production of H2 and to a certain extent under H2O/CO2 co-electrolysis conditions for the production of syngas (H2 and CO). PyroGenesi’s ultimate goal, within SELYSOS, is the fabrication of a high-potential and cost effective solid oxide electrolysis cell, by using the thermal spraying process. The company aims to encompass the developed research innovation with market exploitation and to produce commercially mature and competitive cells, capable to enter in the existing European and global Solid Oxide Electrolysis and Fuel Cell market.